The molecule, called transcription factor IID, is critical to transcribing genes into RNA that will later be used as blueprints to make proteins. Because of its many moving parts and large size, however, TFIID's 3-D structure has been hard to capture: the moving parts become a blur. The new, more detailed snapshots of the molecule's moving parts could help drug designers create drugs that interfere with the molecule's structural changes in order to tweak the expression of a gene that is causing disease. "These structures give you the potential for rationally designing small molecules that will disturb the normal function, because now we don't have just a single structure, we have many structures, which is even more powerful because we can target the motion that we are seeing right now," said Eva Nogales, a UC Berkeley professor of molecular and cell biology and a faculty scientist at Lawrence Berkeley National Laboratory. "Where you stick that drug and how you make that drug operate is highly dependent on the transient nature of these structures, and that is something we have come to realize only very recently," said Robert Tjian, a UC Berkeley professor of molecular and cell biology who discovered TFIID and has worked on the molecule for much of his career, though he was not a co-author of the new paper. "Because these molecules are moving around and their structures are so complicated, conventional drug discovery would never reveal what is going on. Eva's structures are going to change that. This has the potential to open up the universe of druggable targets." "TFIID is probably the hardest structure anybody has tried to solve, because it is massive and it is highly flexible," said Tjian. "The only way you can see these very flexible structures is by cryo-EM, and Eva can now freeze all these different flexible states and describe the movement." Cryo-EM involves freezing a drop containing millions of copies of a molecule, in every imaginable orientation, and using an electron microscope to determine the structure by combining images to define the 3-D shape. Because TFIID has many moving parts as it binds to DNA and gets ready to transcribe a gene, averaging all the frozen positions produces a blurred image. Now, thanks to more than two years of intensive work by Patel and Louder, it's possible to capture higher resolution images that are akin to distinguishing a striker's leg kick from a goalie's hand block and a fullback's header. "Imagine you have an image of the 22 soccer players on the field, and you were to combine them into a single unit that you would call the 'generic soccer player,'" she said. "It will look like a blurry picture—you could barely see that it's a humanoid form and that there is some kind of motion, but you wouldn't realize that a difference exists between the players." "They span the whole binding sequence: before binding to the DNA, initial binding to the promoter, subsequent binding after it double checks that this is the right place, and the final state," Nogales said. 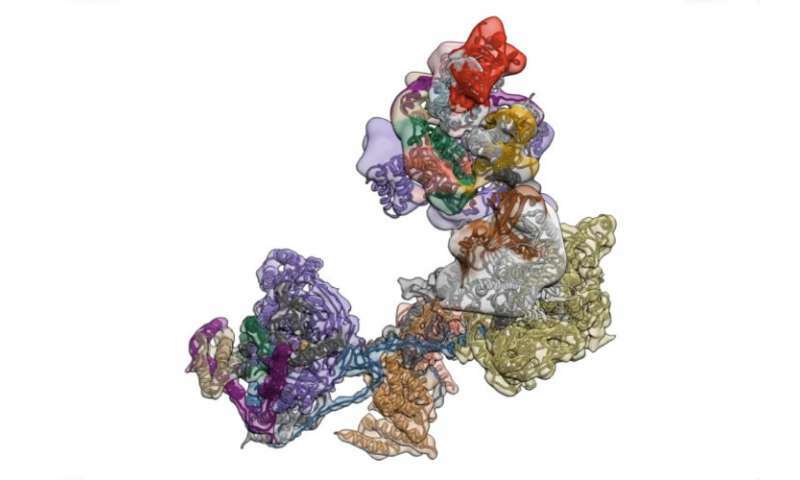 She and her colleagues continue to push the limits of cryo-EM, hoping to determine the 3-D structure of TFIID after other transcription proteins land on it to complete the transcription process.